I know when I fly, I'm a nervous wreck. I hear every little squeak and shudder and feel strongly that I, and everyone else on board, have only seconds left to live. 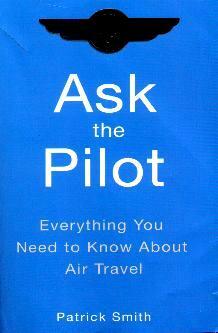 This new book of questions to a commercial airline pilot, Patrick Smith, answers many of our anxious concerns about getting the plane off the ground, keeping it in the air, and bringing it down safely, among the obvious, plus much more (and more for us white-knucklers to worry about). He is the "voice" on Salon.com's "Ask the Pilot" column. This eloquent and sometimes funny pilot's take on the manufacturers and numbering of the plane models, had me chuckling. Then came the questions which were answered in his style (which I like) and he gave explanations that were clear and understandable to the lay flyer, giving light bulb moments to mechanically/engineering/design-challenged people like me. Smith tells a concise story about Concorde, explains turbulence, gives a more than clear insight to the lives of pilots, passengers' safety, and airports around the world. He talks about what pilots earn, in-flight safety, lay-overs, and so much more. A huge amount of best and worst, most and least comfortable planes, safety records, and so on. Really rather informative. I agree wholeheartedly with Smith's introductory comments about people being so blase about flying today. Notwithstanding post 9/11 flying fears, that is. I still am in awe (and fear) of the planes that fly overhead. I often stop and gawk, almost disbelievingly, at the big metal flying machine in the sky. Conclusion - Well-written and amusingly interesting, despite the subject matter. Worth reading.